A course is a collection of lessons. Each course can contain any number of lessons. Each lesson can only belong to a single course. Users register for a course to access that course’s lessons. Courses can also be organized into Course Categories. A course can belong to any number of categories. See Adding Courses and Adding Lessons for more information. If you previously used our free Sensei Modules extension, this is no longer required as of Sensei 1.8. It should be removed via Plugins > Installed Plugins. Sensei now includes Modules by default, adding another level of organization between Courses and Lessons. 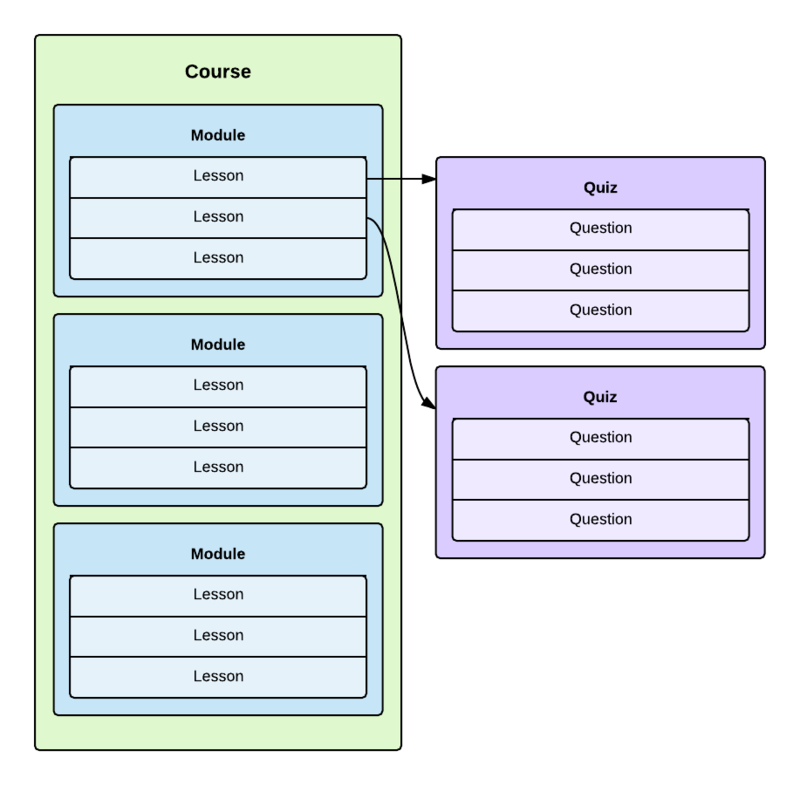 This enables you to group lessons into Modules, creating a hierarchy of Courses > Modules > Lessons. A module is used only to organize lessons within a course, similar to a category. It doesn’t contain any content, other than an optional description. A module can be used in any number of courses. Within a course, each lesson can only belong to a single module. Each lesson can optionally contain a single Quiz to test your students’ learning. Each lesson can only have one quiz, and a quiz can only belong to a single lesson. See Adding Quizzes for more information. Quizzes are made up of a list of questions. A quiz can contain any number of questions, and each question can be used in any number of quizzes. See Question Bank for more information.